The winter season is on its way and before it shows its presence, every brand and designer is busy in introducing his or her own collection for both women and young girls. All of us know that modern and stylish women and girls will all time desire to wear trendy tops and lavish attires that can be easily utilized on different occasions like weddings, functions, birthday as casual wear, party wear, formal and semi formal wear etc. In this field there are numerous of fashion brands and among all of them one of the most prominent and leading brand of fashion is named as Kayseria that in a little span of time get famed not even in its own country Pakistan but also in other countries. Kayseria also present its winter collection with name of Kayseria Hues of Winter Collection 2015-2016. This collection is now accessible on all outlets as well as stores from 10th of October to onward. The old winter collection by Kayseria was made according to innovative and unique in styles. The designer designed all its new winter collection by using colorful and attractive patterns to improve the beauty of both girls as well as women. Kayseria Latest Winter Collection 2015-16 comes along with tremendous range and variety. This winter collection is adorned as per traditional pattern and up to date fashion. These winter dresses for women contain long shirts, shawls with combination of pajamas, tights or trousers. Kayseria brand has been ornamented with superior quality of material along with embellished work and digital prints. 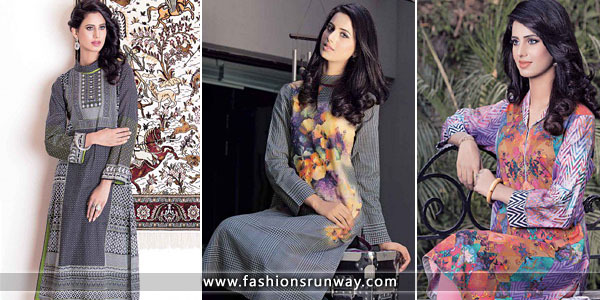 The intricate work of embroidery applied in this designer winter dresses is all eye catching and gorgeous. 19 suits are showcased along with different color schemes and prices of these suits are different from one another. For more details visit its official web page or facebook page and get your favorite designer suit. Check below here online Catalog of Kayseria Winter Collection 2015-2016 for women.